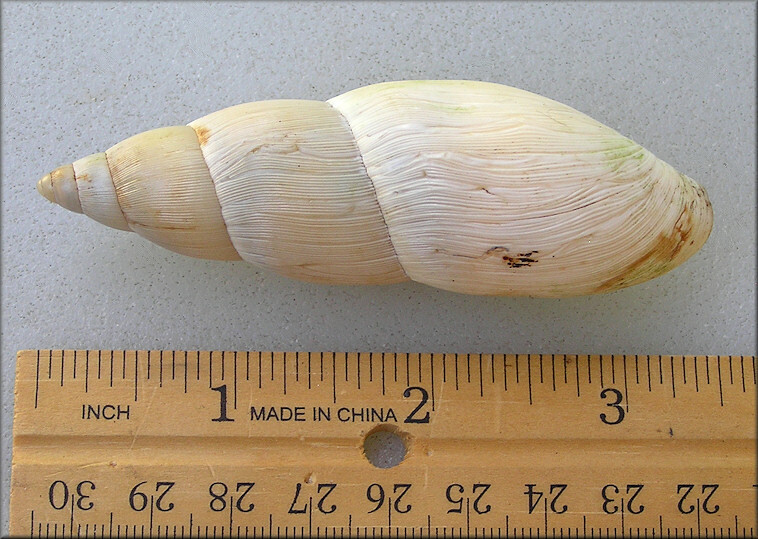 No one knows for sure how large a size that Euglandina rosea can attain under optimal conditions. Pilsbry (1946: 190) reported a 76.0 mm. specimen from Palatka, Putnam County, Florida. 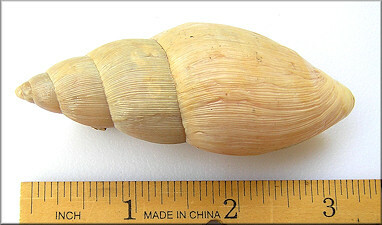 In over a decade of active snailing in the northern part of the Florida Peninsula (Nassau, Duval, Clay, Baker, Columbia, Putnam, St. Johns, Lee, and Alachua Counties) and southeastern Georgia (Camden and Charlton Counties) the largest specimen ever found by the senior author measured a rather modest 66.5 mm. - this despite his explicitly searching for large snails and examining hundreds of specimens. This lack of success in finding large specimens came to an end on 10/6/2015 when an empty 77.2 mm. specimen was discovered in the roadside swale along US-1 in St. Johns County about 3.1 miles north of its intersection with International Golf Parkway. A return visit to the site on 10/12/2015 yielded a 87.0 mm. giant (pictured below, top image) as well as other outsize specimens measuring 80.4, 77.8, 77.2, 75.8, 72.5, 70.0 mm. and half a dozen other specimens measuring in excess of 65 mm. (including two that were alive). The 87.0 mm. 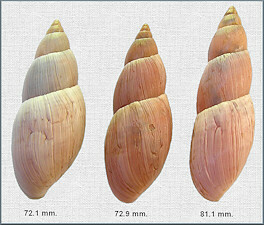 specimen is likely the largest Euglandina rosea shell ever documented and may well be the largest specimen of a native land shell ever collected in the United States or Canada. 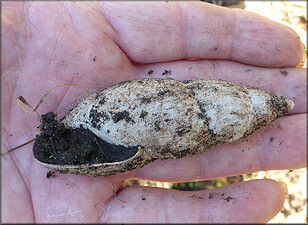 Two other native North American land snail species are known to attain a larger size - Euglandina sowerbyana (L. Pfeiffer, 1846), 110 mm. and E. vanuxemensis (I. Lea, 1834), 100 mm. Both occur in Mexico. Schileyko, A. A., 2000. Treatise on Recent terrestrial pulmonate molluscs 6. Rhytididae, Chlamydephoridae, Systrophidae, Haplotrematidae, Streptaxidae, Spiraxidae, Oleacinidae, Testacellidae. Ruthenica supplement 2: (ii) + 731-880 incl. numerous text figs. Dec.
Thompson, F. G., 1987. 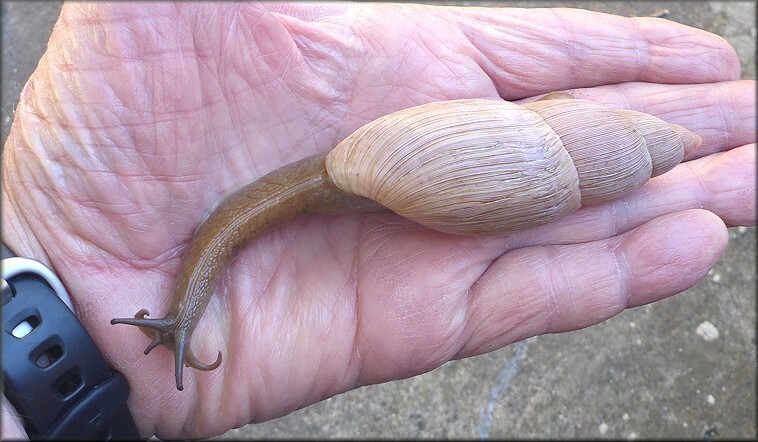 Giant carnivorous land snails from Mexico and Central America. Bulletin of the Florida State Museum 30(2): 29-52. 1 April. 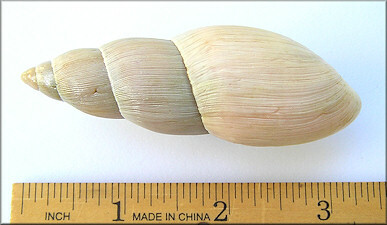 The specimen pictured above measures 87.0 mm. was found by this reporter in the roadside swale along the east side of US-1 about 3.1 miles northwest of International Golf Parkway, St. Johns County, Florida on 10/12/2015. 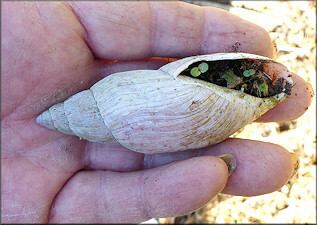 It is likely the largest Euglandina rosea shell ever documented. The specimen pictured above measures 82.8 mm. was found by this reporter in the roadside swale along the east side of US-1 about 3.1 miles northwest of International Golf Parkway, St. Johns County, Florida on 3/2/2019. 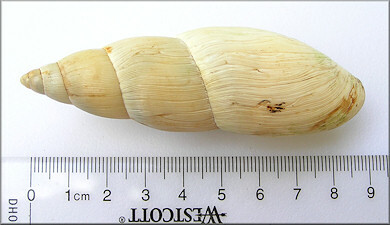 It is the largest living Euglandina ever found by this reporter, and including empty shells, the fourth largest specimen ever found. St. Johns County, Florida - 87.0 mm. St. Johns County, Florida - 83.5 mm. St. Johns County, Florida - 82.9 mm. St. Johns County, Florida - 82.4 mm. St. Johns County, Florida - 81.1, 72.9, 72.1 mm. St. Johns County, Florida - 80.4 mm.